Located 3 km to Siriraj Hospital and Wanglang Pier, Riski Residence Bangkok-noi (Wasit Apartment) offers free Wi-Fi throughout the property. Free public parking is available on site. 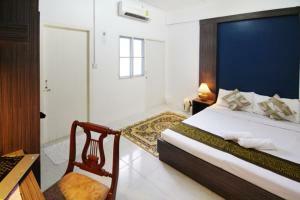 The residence is 4 km from Wat Arun and 4.8 km from Khaosan Road. It is 6 km to Emerald Buddha Temple and Grand Palace. New Southern Bus Terminal is 6.8 km away. Each air-conditioned room is fitted with a flat-screen TV, fridge and electric kettle. A seating area and wardrobe are provided. Shower facilities are included in an en suite bathroom. A range of local dining outlets are located 20 metres from the property. Air-conditioned room is fitted with a flat-screen TV, fridge and electric kettle. A seating area and wardrobe are provided. Shower facilities are included in an en suite bathroom.